HMV will continue, 100 of the 127 stores will remain. The great English heritage brand, HMV, has been bought by Doug Putman, owner of the Sunrise Records chain in Canada. Putman had previously bought the HMV Canada chain and rebranded them as Sunrise Records, but because HMV has been such a strong brand in the UK, it will continue under that name. This is great news for all fans of physical product, it's far from over for our little hobby. Hope the new HMV will concentrate on physical product, and leave all the peripheral matter like technology items for other stores to pick up on. Surprisingly though, the HMV flagship store on Oxford Street will close, the last of the original four on that street alone. It was HMV's first ever store, and it opened at 363 Oxford Street in 1921, before moving to a larger store at 150 Oxford Street in 1986. It's been back at its original home since moving again in 2013. 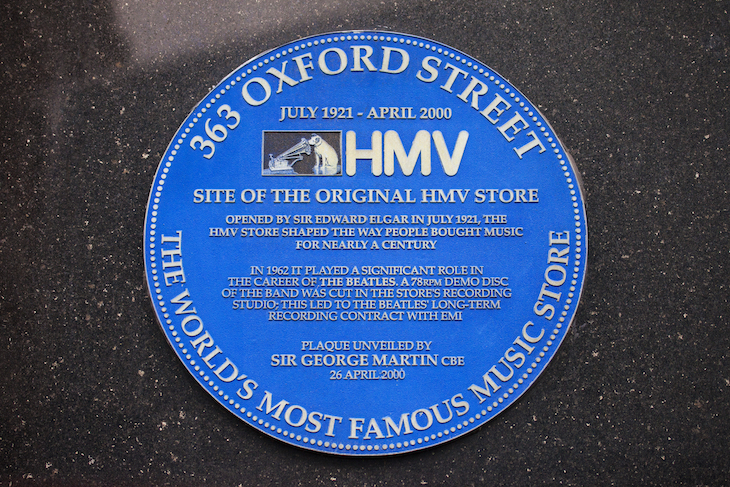 The history of the 'world's most famous music store' is commemorated by a blue plaque on the exterior of the building. I'm not sure: the last album the new owner bought was Supertramp. He would have got more cred if he said he’d downloaded it illegally! Nervous Ned wrote: He would have got more cred if he said he’d downloaded it illegally! Get the boring bugger BCBd, his carriage in prog corner awaits.